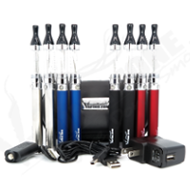 The new VZ eGo-T2 Passthrough E-Cig kit builds on the accomplishments of the previous versions. The T2 holds approximately 2.4ml of e-liquid and features replaceable coils. The clear tank of the T2 makes monitoring your e-liquid level easy. The T2 keeps your e-liquid fresh tasting and produces good vapor. The power saving battery features improved power conservation and prevents accidental discharges.